Cambridge University Press. ISBN 0 521 46086 7. January 1996. Human expertise in these and many similar problems is being supplemented by computer-based procedures, especially neural networks. Pattern recognition is extremely widely used, often under the names of `classification', `diagnosis' or `learning from examples'. The methods are often very successful, and this book explains why. 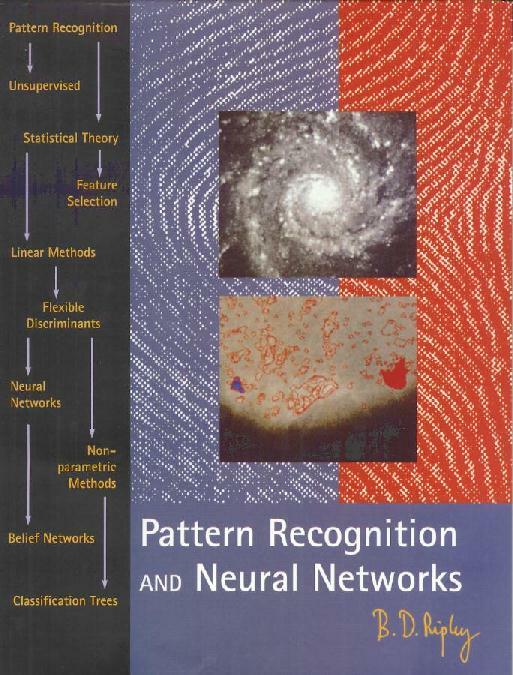 It is an in-depth study of methods for pattern recognition drawn from engineering, statistics, machine learning and neural networks. All the modern branches of the subject are covered, together with case studies of applications. 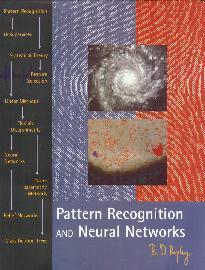 The relevant parts of statistical decision theory and computational learning theory are included, as well as methods such as feed-forward neural networks (multi-layer perceptrons), radial basis functions, learning vector quantization and Kohonen's self-organizing maps. The theory explains how to tune and assess the methods. Methods are illustrated by case studies on real examples, the data for which are available over the Internet. Comprehensive account of the theory, including new, simplified, proofs. New insights from integrating ideas from different disciplines. Includes belief nets and probabilistic expert systems. This is a self-contained account, ideal both as an introduction for non-specialists and also as a handbook for the more expert reader. The Preface is available on-line. Some reviews are reproduced here. The Kaufman & Rousseeuw software (pp. 311-312) is available as a single file of Fortran programs. There is an Errata list available, and the references can be searched or retrieved. The `complements' provide an on-line updating of the book, both adding new references and ideas, and amplifying points in the light of readers' experiences. This is available as to be read on the Web or for downloading as PDF (for Acrobat Reader) or postscript or gzip-ed postscript. This will be updated from time to time: the current version is 23 August 1996. Links are provided to CUP's home page and page for this book. In the USA they have home page and page for this book. You can order from those pages.